Hot Yoga? YES we have it! Melt away stress and steam your body open with hot yoga. Far infrared heat panels and high capacity humidifier create the optimal environment to stretch in. Infrared heat panels convert light directly to heat, warming the objects in the room without raising the air temperature. This type of heat is most like natural sunlight. In fact, 80% of the light that makes it to Earth is infrared, making it a form of light that is easily processed by our bodies. As you walk into the hot room, you will feel a gentle heat radiating from the floor and walls that will increase as you begin to move through the practice. The humid air adds another layer of warmth, balancing symptoms of our cold, dry climate while promoting flexibility, circulation, perspiration and detoxification. As your body absorbs infrared waves, molecules begin to vibrate, causing them to expel toxins, fat and impurities from your cells into your blood stream, released from your body in the form of sweat. This works in synergy with the yoga exercises, resulting in a deep cleansing effect at a cellular level. Our water wall and six foot fireplace add the ambience of pure elements and provide the opportunity to choose your heat level. 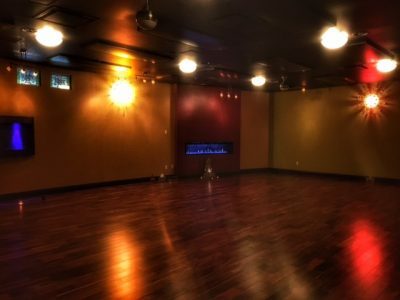 Yoga in our Infrared Studio will give you more than just an amazing workout. There are numerous added health benefits that come along with practicing at our infrared heated studio. Our warm classes are heated to 85 F, 30% humidity and our hot classes are heated to 96-98f, 40% humidity. Like it hotter? Place your mat near the fireplace. Like it cooler? Stay on the water wall side. Arrive early and be on your mat at least 5 minutes prior to the start of class to give time for your body to adjust to the temperature. Stay hydrated! Drink plenty of water before, during and after your class. Adding a pinch of sea salt and a squeeze of lemon to your water will rehydrate your cells while optimizing electrolytes, minerals and vitamins. Adding electrolyte powder to your water is also a great option. Bring a water bottle and refill as needed at our water station. Go at your own pace. Modify postures and rest when needed. Hygiene is key. Bodies heat up, increasing odors, so arrive clean or shower at the studio before class. Bring a hot yoga towel or beach towel for excess sweat, or rent one at reception. Support your practice with a healthy diet rich in fruits and vegetables and high quality proteins and fats. Smile and enjoy! Hot yoga will help you feel calm and fit by decreasing stress and optimizing your health.